Every single inch of this gravel sportive is on gravel. We hope you weren’t expecting a bunch of pavement! If you are up for a big day, the 80-mile route will not disappoint. How does 7,200 feet of climbing on steep dirt and gravel sound? Being the Wild West, our Colorado gravel route isn’t just wide-open roads; we go deep into the backcountry on rugged two-tracks as well. The mid-point is punctuated with a stunning overlook view of the Colorado River. From there, it’s a steady push up to 7,100 feet. 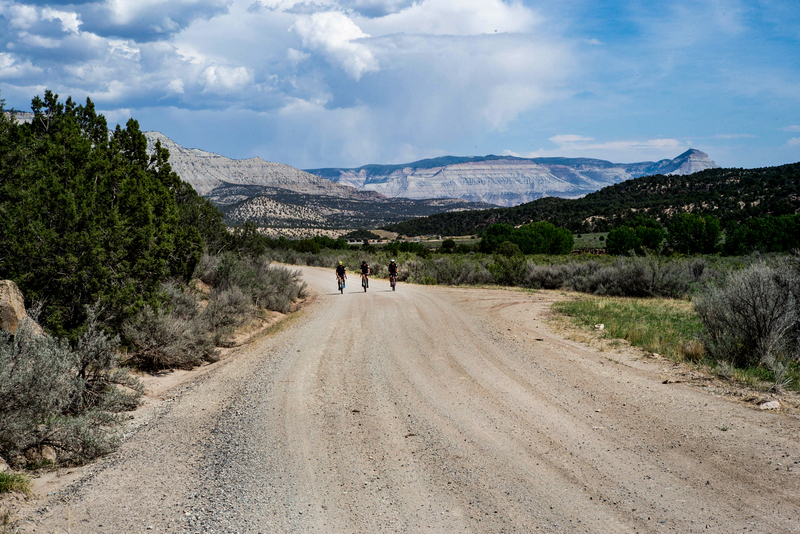 From there, you might be tempted to head straight back to the High Lonesome Ranch on the main gravel road – and you can – but the full 80-mile route tackles one last steep climb. It’s just two miles, but at an average gradient of 8% it’s going to sting! Once atop the ridge, it’s time to enjoy a winding cruise with expansive views of the entire valley below before finishing with a steep, slaloming descent back down to the High Lonesome Ranch. The 50-mile route is one big loop, with nearly all the climbing coming in the first half as we got deeper into the wilderness before banking back towards the Colorado River. We will be on the same route as the 80-mile riders for the first third, climbing up over 7,000 feet and passing some crazy gremlin formations. Stick around after your ride for the post ride celebration, lunch/BBQ, ranch activites and live music. Inform your friends and family that the expo is also open during the ride itself, so while you are on the course, they can enjoy the exhibits. A portion of all registration proceeds will go to support Friends of the Mustangs in their efforts protecting and preserving wild horses throughout Grand Junction. Click here to learn more about the Wild Horse!